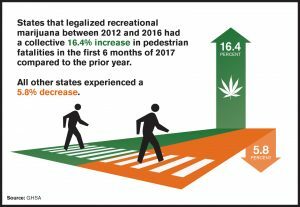 The number of pedestrian fatalities in traffic accidents have risen sharply in states that have legalized recreational marijuana compared to a decline in states that have not. Although a cause and effect link has not been firmly establish yet, a worrisome correlation is staring to appear. While population growth and the use of distracting technologies may play a role in the increase in car accidents involving pedestrians, the fact that marijuana legal states are seeing more fatal pedestrian car accidents may signal a problem. If legal marijuana use is to blame for more pedestrian car accident fatalities, questions arise as to whether it is caused by impaired drivers, impaired pedestrians or a combination of the two. Studies are ongoing. Hitting a pedestrian can cause serious injuries and fatalities of course. Even cars travelling at moderate speeds can severely disable or kill a pedestrian. The best way to avoid pedestrian accidents is to remember that pedestrians, and bicyclists for that matter, are extremely vulnerable compared to those driving in motor vehicles. Avoiding the common factors associated with pedestrian car accidents and giving pedestrians wide berth can reduce your chances of getting into an accident. Stoltze & Stoltze, PLC, has decades of experience with pedestrian accident cases. Our team of personal injury attorneys use skill and negotation to represent your interests to get you the compensation you need following a pedestrian accident injury.